However Improbable: "I know how to shoot." "Oh yes, I've seen. It is very American. Fire enough bullets and hope you hit the target." "I know how to shoot." "Oh yes, I've seen. It is very American. Fire enough bullets and hope you hit the target." I am having trouble figuring out how the actual designs will end up looking in the end, and working out how I want to have the final layout for each book page. Another friend sent me the link to a fellow author who pretty much did the same thing with her books as I've done with mine. I think I might draw some inspiration from her because I love how she did the layouts. If I do plan to re-do the book's pages, I think it is time I find a sword I can snap in two for The Broken Blades page. Using Aragorn's sword for the final design might be considered copyright, or thievery, or some fancy word I don't feel like thinking up right now. I have run into problems with finding a sword that I can break. One is that swords are my favourite weapon and I don't want to buy one just to snap it in two - we need a broken sword for the cover when I get closer to publishing. Also, the actual snapping has me a little worried. I don't think I have any friends who would willingly put their full weight on a sword to break it. If we don't find a safer means of accomplishing this, I have a feeling one of us is going to be rushed to the doctor with a jagged bit of metal sticking somewhere in their body. Not that it is any less dangerous than other things we have done during our lifetimes. But, enough of that. Today is Wednesday, world building day. Only I caught the flu and don't really feel like...thinking. Instead, I will just write things and see if something intelligible comes from it. I am still working on editing. It was going very well till I got to one character who comes to an untimely end. (I've warned before that someone dies, so now, if I haven't made it official I am. Someone dies.) While I was editing a scene with said character I realized that that one scene was the last time he would be with a certain someone he loved. (There, did I make that complex enough?) And then I spent the rest of the day sulking, because I didn't want to kill him in the first place. Actually, I haven't really stopped sulking about that scene. So many people die in these books, I think it is just because I told them all not to die and they had to do the opposite. Why listen to the author? It isn't as if authors know anything about story telling. I shouldn't complain. Their version of the book is better than the first draft I wrote without their help. But I don't care. They died on me. I plan to complain as long and loud as I please. It is very cool and rainy here today. If I wasn't sick I would be outside, walking in the rain without my umbrella. I am hoping we get a lot of snow before November as it is SO much easier to do NaNo if there is snow outside. Yesterday this picture ruined what I thought was special Dalek bathrooms in England. I still haven't recovered from disappointment. I am nearing the end of series two of Merlin. It is very depressing because Morgana is turning....wait, I don't know if that might spoil the show for anyone. Forget I said anything and go watch it for yourself. And I think I will leave now and finish watching cartoons. Or maybe an animated movie...like Epic or Tintin or Rise of the Guardians...or all of the above. Quote is from The League of Extraordinary Gentlemen. If you haven't seen it go and watch it, now. Maybe you could have someone draw a sword broken in half? Haha, I still can't see the shower. Hope you feel better soon! Get lots of rest. Love that shower sign. That's hilarious. Have you looked at stock photo sites (i.e. Shutterstock) for a picture of a broken sword/blade? I don't know if they'd have one that would work for you, but it might be a possibility. Like M.J. said, I would look at stock photo sites for a broken sword. That might be much easier than breaking one yourself. Good luck with everything! 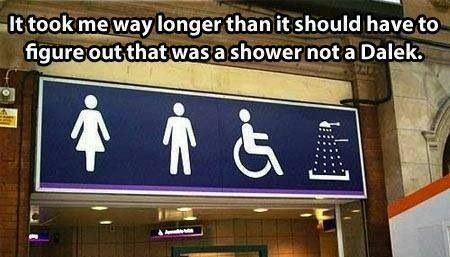 I love the Dalek-shower sign. Can you locate a blacksmith? I bet he'd have some swords already broken. That sign is really cool. Oh, series two is where I first started with Merlin! It is really quite a wonderful show. I just finished it recently, and it was ended quite excellently, in my opinion. Watching semi-mindless cartoons in not a bad thing in my book! They stimulate the creative juices. I have not seen that movie yet! I want to. :) It sounds fun! Breaking swords? Eeek! That's gonna be tricky. They're sort of made not to break aren't they? ....To bad you don't own Anduril in the still broken state. Or would that be Narsil? *Shrugs* I guess that would still leave you with copyright issues. Unless you could disguise the hilt a little. A broken sword would look so cool! I love the idea! I wounder how you could sort of fake a broken sword. *taps chin and ponders* ......Hmmm. I got nothing! I hope you figure something out though. It's a really cool idea. Looking for a photo is so frustrating. All the best!